Your Front Row Seat to the Greatest Clipper Race of All Time! On September 6th, 1866, tension was high among London's citizens. For months, newspapers around the city had been providing a wave-by-wave account of the biggest clipper ship competition to date, and betting hit a fever pitch as the ships bore down on the finish line. Tea was big business in mid-19th century England, and the first ship of each season to make it to the banks of the Thames was historically rewarded with a huge bonus. Years of competition built up to a huge race in 1866, with 57 clippers vying for the prize. Loaded up with around a million pounds of tea each, the Ariel, Fiery Cross, Serica, Taitsing and Taeping led the pack with their brilliantly engineered ships and famous captains. After months of sailing through the Indian Ocean, around the southern tip of Africa and up the Atlantic, the Taeping arrived in London at 9:47 PM on September 6th, beating the runner-up Ariel by only 25 minutes. The competition would prove to be among the last of its kind as steamships began to rule the seas and the opening of the Suez Canal cut the journey by thousands of miles. 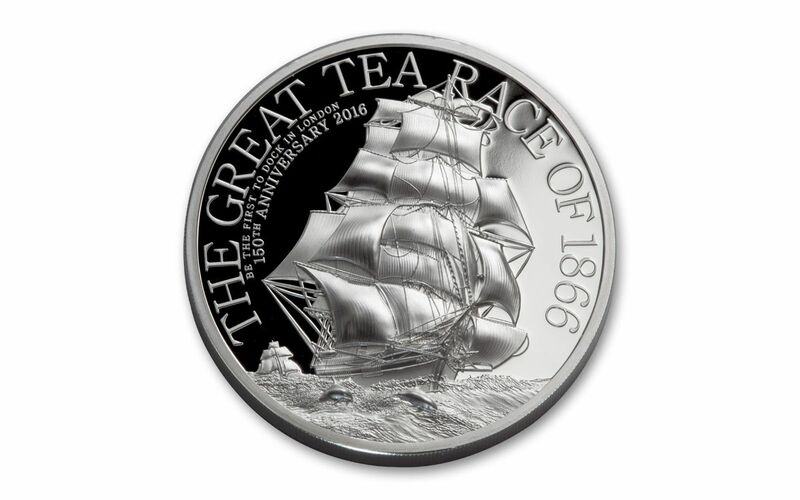 But the excitement of that historic competition can now be a part of your collection with this 150th Anniversary Great Tea Race of 1866 Proof! ADVENTUROUS DESIGN!-- Inspired by the famous painting by British maritime artist Jack Spurling, this coin's design features the Taeping as it cuts through the waves. With two dolphins pacing the ship in the foreground and the Ariel trying to catch up in the background, the final hours of the race are depicted in exceptional detail. 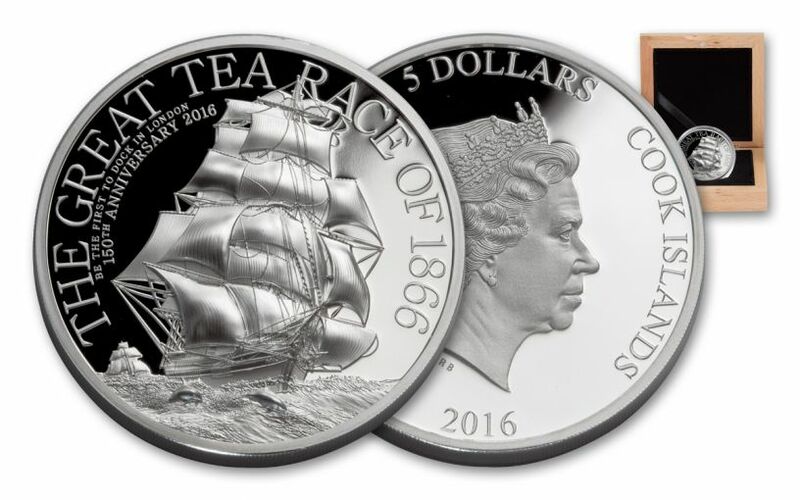 PROOF-MINTED IN HIGHLY PURE SILVER-- Each 2016 Great Tea Race of 1866 coin begins as a hand-selected, one-ounce planchet of 99.9% fine silver. Then, using polished dies and multiple strikes, state-of-the-art smartminting© technology transforms each blank into a proof-minted, high-relief masterpiece with incredible depth. 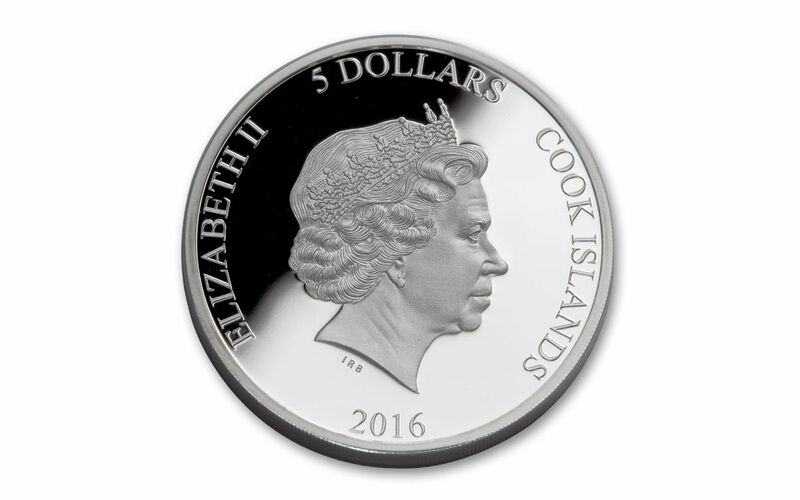 COOK ISLANDS LEGAL TENDER-- Each proof is five dollars Cook Islands legal tender, confirmed on each coin's obverse along with Ian Rank-Broadley's profile of Her Majesty Queen Elizabeth II. PHENOMENAL PACKAGING!-- Your 2016 Silver Great Tea Race of 1866 Proof will come secured in a beautifully crafted wood presentation box along with a certificate of authenticity. A LIMITED MINTAGE EVENT! 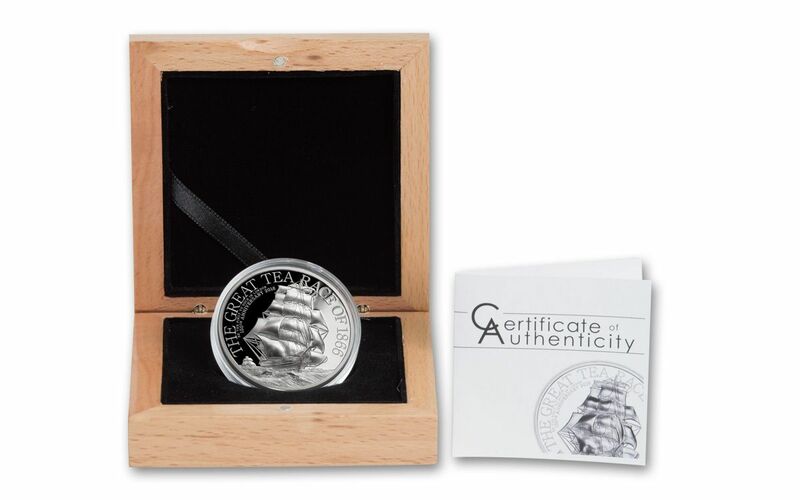 -- The mintage for this silver proof has been set at only 1,500 coins for collectors worldwide! With its superb features and fascinating story, this silver proof is just at home on a numismatist's mantelpiece as it is on a sailor's bridge. This coin is a perfect gift, whether it's for someone you love or even yourself! Just don't wait for this proof to sail out of sight -- tug it over to your cart today!